Delightful craft. Expanding world. Flawed but growing characters. These phrases well summarize Rite of Revelation by Sarah Negovetich. SUMMARY (from back): Before you Stands the Future. The Cardinal plans to execute seventeen-year-old Rebecca Collins, just as soon as he gets what he needs to solidify his rule over the United Territories. Faced with certain death, Rebecca discovers not everyone is under the Cardinal’s control. A new alliance helps Rebecca and her friends escape the PIT, giving Rebecca a chance to live the life her Rejection took away. But the Cardinal needs her in order to stay in power, and he doesn’t care who has to die to bring her back to justice. Her last fight was a push to survive. This time, Rebecca has a life that might be worth dying for. 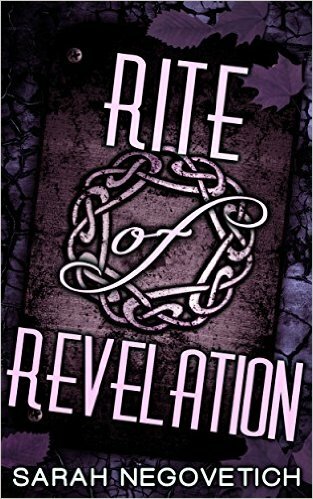 WHAT I THOUGHT: When I started reading this second installment in the Acceptance series, I wasn’t clear what the title, Rite of Revelation, meant especially in the context of the series. It becomes clear at the end and that revelation is what will move the narrative forward into the final book. It was definitely appropriately titled. Sarah Negovetich’s craft again delighted me for her prose are crisp and dialogue efficient. It’s clear she’s studied craft and I appreciate her mastery. The world built in book one grows in book two and we find out there are 142 freeman colonies. With the complexity of trade between each, we come to understand how these folks not only survived, but thrived apart from the economy of the Cardinal and his power. Although the threat always loomed and the reader wonders when the other shoe will drop. I loved how Rebecca grows in this book as well as her counterparts. I appreciated how she wrestles with the balance between passion and action. Her propensity to go off half cocked, while at times admirable, is becoming a flaw that I speculate will cause her and others problems in book three. One complaint I had about Rebecca is that her taking on the problems of the world and feeling guilty if she can’t save everyone gets to be too much at times. I felt like shaking some sense into her. I question whether anyone in life would ever go as far overboard as she seems to. I felt going “there” too frequently made her annoying at times. But the other characters grow as well and these maturings seemed appropriate, especially Eric and Patrice as well as Liam. All in all I enjoyed book two and give it 4.5 stars. Now to await the final showdown in book three. Previous Previous post: Dragon’s Revenge Cover Reveal! Next Next post: Cover Reveal for Water’s Wrath by Elise Kova! !